architecturally focused, neat and nimble, creative and quirky aegis interior design limited is a small, selective, multi-format agency based in Farnham, Surrey. aegis interior design, over the last ten years has helped clients; re organize their existing space, plan their home extensions, secure planning permissions, re design their bathroom, improve their lighting and rejuvenate their homes. How can we help you? “I would like my home to look like an art gallery”. Snow white walls, seamless flooring and stunning lighting helped create a clean and clear aesthetic, perfect for the clients colourful artwork. Guest accommodation to rival the best boutique hotels. A neat design, modest and unobtrusive from the exterior, luxurious and eclectic on the interior, sitting comfortably in the Surrey countryside. 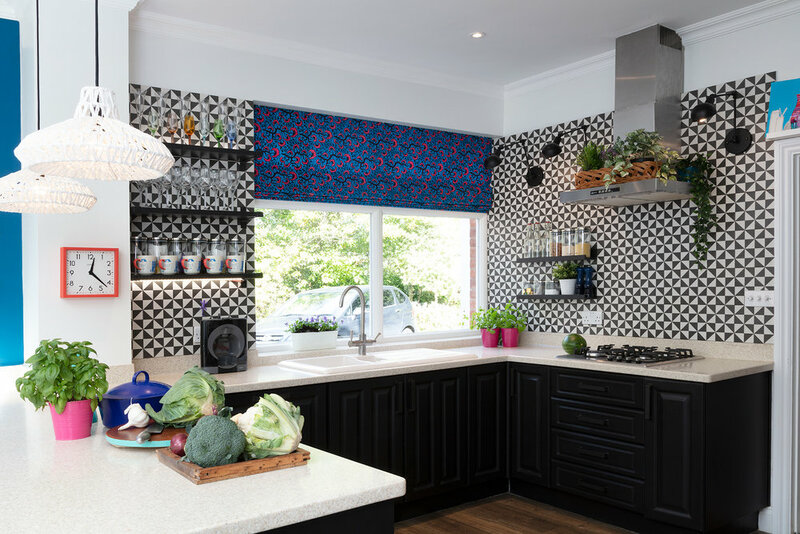 A visually exciting and surprising renovation juxtaposing black and white geometrics, African prints and eclectic colours all grounded by white walls and neutral flooring.